A friend of yours invites you a charity gala dinner organised by her business. By coincidence, you both turn up at the same time, her Jag just beating your Golf into the car park. As you say hi, you notice the glamorous dress she’s wearing: a Balenciaga no less. Her diamond necklace nearly blinds you as she talks about her recent three-week sojourn to Sri Lanka. As you listen, you start to wonder ‘where the hell is she getting all her money from?’ You work in the same industry, your businesses are around the same size, you’re both in charge. The only difference as far as you can see is you’re working 60 hour weeks and the odd weekend - and she’s not. The truth could be one of many things. Maybe your time management is wildly inefficient, maybe you’re not paying yourself enough or maybe - just maybe - your business has its pricing out of whack. Pricing is a wolf in sheep’s clothing. Although it might seem a relatively simple thing to get right, it’s one of the biggest challenges that companies face. So how do you know if your pricing is wrong, and what can you do about it? How do you know if you’ve got a problem with pricing? To see how pricing can be a problem, look at Uber. When they launched, the service significantly undercut the local competition to accelerate growth. It worked - but only to an extent. You might generally expect to pay a premium for the reliability and accessibility for a service like Uber, but the firm typically offers fares 25-30% lower than the local rate. Launching operations in 737 cities across 84 countries may look like impressive growth, but if it’s not backed up by profit, something’s got to give. By dropping prices, you devalue your offering and your brand. It’s an admission that your company’s USPs are not strong enough or different enough from your competitor’s. Your sales team will be 100% focused on selling low and this will have an impact on your P&L. If price is your only competitive feature, there’s only one way you can go: lower and lower. Low prices might give you a great looking top-line figure, but it won’t take long for your bottom line to pay the price - and it’s the bottom line that matters. Desires and purchasing choices are not driven by price or even necessarily by need. They’re driven by perceived value. So states the ‘paradox of value’ or the ‘water-diamond paradox’; a conundrum that has attracted some of the greatest minds throughout history, including the economist Adam Smith. The paradox of value questions why a glass of water costs next to nothing and a diamond costs so much. One sustains life and the other simply sparkles. Yet, we want the diamond more and attach a much greater value to it. Is it because they symbolise success and wealth? Or because others want them? Or because they’re hard to find? Or because of our human love of beauty? Who knows. One thing is clear though: perceived value is a much more powerful driver than price. People like value. In all walks of life, we want to know we’re getting a good deal. That’s not to say we want things to be cheap necessarily - we just want a bit more bang for our buck. It’s why we’ll buy four Easter eggs for the price of two even though we had no intention of buying any at all. Supermarkets use these self-liquidating tactics to encourage people to buy - and they work perfectly. The promotions we see at the ends of the aisles make us feel we’re getting value for money. This, in itself, is invaluable to brands. Even when they sell specific products at a loss, the long-term benefits of making customers feel they’re getting a good deal can pay dividends. By thinking of price in terms of value, you can set a price which reflects the value you deliver. Again, this comes down to doing your market research and gathering as much information as you can about your customers. What do they value? For example, if they would value free delivery, work out how much it’s worth, and factor that into the price - but keep making a big deal of the free delivery. Not only do you protect your margins and bottom line, you also enhance the customer’s experience of your company, making it more likely that they’ll come back. Luxury brands often justify their premium prices and enhance their value by offering suitably indulgent customer experiences. If you’re a Nespresso member popping in to buy a new machine or coffee capsules, you can enjoy a free Nespresso at their coffee bar; Jo Malone offer free hand massages to customers; Lexus dealerships are renowned for their excellent customer experience. All of these things add value without touching the price. Even low-value retail brands understand the principles, too, although they look slightly different in practice. The likes of Currys or Oak Furniture-land know customers value a discount - so the retailers artificially raise their starting price, and then present everything as discounted. The net result is healthier profits, customer satisfaction and a shift in focus away from price, towards the value of the brand. The business leaders that we work with, for instance, have said they value confidence, expertise and being able to pass their problems onto someone else. None of these things have a price attached but that’s what we charge for. So what do your customers value? Finding out is the key to pricing for value. How much value does your company provide? If there’s a big discrepancy between the two, how can you change that? What makes your company different from competitors? What are the different mechanisms of pricing? Are you using the same margin for all products? Have you taken all the costs into account? How do you charge your customers? Would they prefer a one-off fee or a subscription? Can you add value by grouping products or services together? All of these will help you determine where your pricing is failing and how you can shift the focus towards value. In negotiations, re-focussing the discussion towards the fact that the price reflects the value of your products, will help you stand firm. It’s doubly important in a B2B setting, where the person at the other end is trained to pull things apart, negotiate the individual elements down, bring their own ask in at the end of a conversation. You need confidence in your offering and its value; don’t do the other party’s haggling for them. By demonstrating confidence in the value of your products and services, you can position your brand as a market leader in a sea of companies that are quick to drop their prices. And in a sea of similar businesses, you don’t want to be more water. You want to be diamonds. 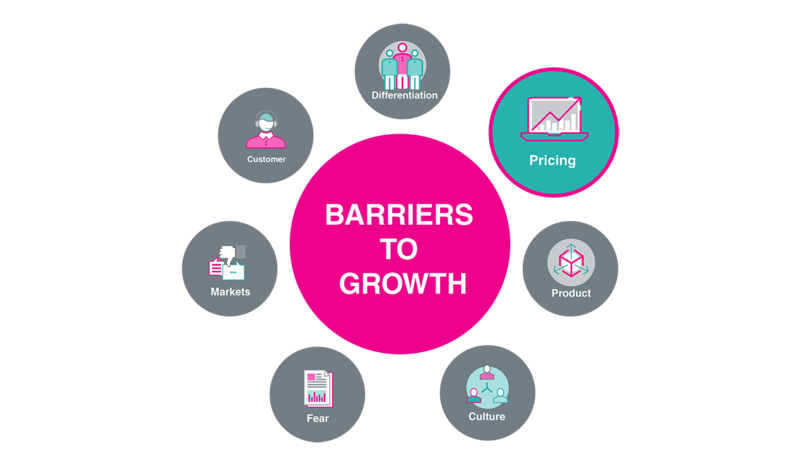 Is pricing one of your barriers to growth? Or perhaps there’s another area of marketing where you’re falling down? Take our free Marketing 360 Healthcheck to find out.